​Wright, N. (2012), ‘Just Do It – A Case Study in Gestalt Experiential Coaching’, Industrial & Commercial Training, Emerald Group Publishing Ltd, Vol 44, No2, pp67-74. That Gestalt-orientated coaching characterised by physically doing, as distinct from coaching characterised by conventional talking, can release and create powerful insight, energy and transformational potential. Doing something is qualitatively different to thinking about it or even talking about it. Doing has an impact on what I’m thinking and feeling. I’m working on a difficult mental problem, I feel stuck, I go for a walk and physical movement seems to create psychological movement, allowing fresh insight and ideas to emerge. I feel energised and motivated to tackle the problem in a new way. In this vein, I feel inspired and intrigued by Gestalt’s approach to experimentation and improvisation, its emphasis on creating vibrant, risky, here-and-now opportunities, ‘safe emergencies’ for exploration and awareness-raising (Zinker, 1977; Clarkson, 1999). For this case study, I invited Sally to be my client, a leader in a large public sector organisation who had worked with executive coaches from psychodynamic and cognitive behavioural schools. We were both interested to see how she might experience and benefit from a more experiential approach. I drew on psychological research from a range of sources, including Gestalt psychology, therapy and coaching (e.g. Zinker, 1977; Clarkson, 1999), intuition (e.g. Sadler-Smith, 2004, 2008), body work (Ernst & Goodison, 1981), learning styles (e.g. Honey & Mumford, 2000) and experiential learning (e.g. Kolb in Smith, 2001; Beard & Wilson, 2002). A limitation of traditional conversation-based coaching is that a client’s mind may unconsciously filter or suppresses knowledge that he or she considers unacceptable or unbearable. If the coach tries to surface this knowledge, he or she can evoke defensive routines, expressed as some form of resistance (Clarkson, 1999). Alternatively, a client’s mind may become blinkered or fixated, focusing only on that which captures his or her immediate attention or imagination (figure) and unaware of what lies behind (ground and field), the ‘what else’ of a client’s experience (Yontef, 1993; Parlett, 1999). Physically acting out can raise hidden, repressed, tacit or subconscious knowledge into conscious awareness. The body bypasses psychological filters and defences and ‘speaks’ in the here-and-now that which the mind may have rendered unspeakable, or reveals underlying issues and aspirations that otherwise lie outside of the client’s awareness (Ernst & Goodison, 1981). Research into intuition sheds light on the profound relationship between physical experience and knowledge. It’s as if the body can retain and release tacit knowledge acquired by implicit learning, that is, learning by experience. Intuition is often described using physiological language, e.g. ‘hunch’ or ‘gut feel’. Sadler-Smith comments that “gut feelings are inevitable, but effective learning from them is not.” (2004, p84). A coach needs to learn how to recognise and use intuition effectively and to enable the client to do the same. Reichian bodywork similarly recognises how people commonly use somatic language to express psycho-somatic phenomena, e.g. stiff upper lip, carrying the world on one’s shoulders, behaving spinelessly, putting on a brave face. A bodywork coach will enable a client to explore his or her experience by experimenting with physical posture or movement, noticing what emerges, then seek to enable to the client to make sense of that observation. (Ernst & Goodison, 1981). A challenge in coaching is therefore is to create a suitable catalytic opportunity that enables both physically acting out and sense-making, “decoding messages from the body” (Corey, 1996; Joyce & Sills, 2010, p148). Some coaches encourage clients to give parts of the body a ‘voice’. A Gestalt coach may create experiments that involve the client acting out an experience or a scenario to see what emerges into awareness by physically doing it (Zinker, 1977, Clarkson, 1999). The Gestalt coach may draw the client’s attention to his or her physicality; physical movements, gestures, postures, emotional expression etc, encouraging the client to exaggerate or ‘stay with’ in order to amplify or intensify them. In doing so, such interventions enable the client to establish contact with his or her own immediate experience, the underlying psychological and emotional state, and thereby surface it into conscious awareness (Corey, 1996; Clarkson, 1999). Similarly, the coach may encourage the client to practise new scenarios or to experiment with new experiences in order to develop the confidence and capability needed to embrace fresh opportunities and challenges in the future (Corey, 1996; Clarkson, 1999). The approach is immediate and active, characterised by ‘try X’ rather than ‘how would it be if you were to try X’. It enables embedment of learning by integrating it holistically into the client’s psycho-somatic experience. Gestalt’s emphasis on experimentation is an activist and experiential approach; it involves learning by doing (Honey & Mumford, 2000). Beard & Wilson describe experiential learning as, “creating a meaningful learning experience” (2002, p1). The value of experiential learning lies in sense-making through experiencing. I believe Gestalt-orientated coaching offers opportunities for experiencing, sense-making and profound re-experiencing as a route to transformational development. Based on this research, I developed a simple reflective practice framework to guide my coaching sessions with Sally (fig 1). We had 3 x 1hr sessions within a 2-week timeframe, with 15 minutes at the end of each session to review and capture learning. Sally wanted to enhance her leadership. As she spoke, I noticed key words that seemed to carry an underlying resonance, e.g. feel driven, get carried away, speaking in passive voice. I wondered what an active reframing might look and feel like if enacted as a polarity (driven vs driving), what insights might emerge, how this might shift Sally’s self-concept and behaviour as a leader. I walked to one end of the room. This place represented Sally as driver, fully in control, not driven or controlled by anyone or anything else. I then walked to the other end of the room. This place represented Sally as driven, not in control, driven and controlled by circumstances or others. I invited Sally to join me on the continuum. Sally immediately walked towards the ‘driven’ place, paused as she approached it and looked tearful. “Woah, this is strange, I feel really emotional here.” I encouraged her to stay with the emotion, to experience the feeling of contact with it and to depict what it might look like physically. She pulled up a chair, sat on it with eyes closed, bent forward with head in hands. I asked what she noticed. “It feels like a foetal position.” I mirrored her posture and commented how it looked and felt like a closed posture, an attempt to withdraw to a safe internal space, how one might protect oneself from physical attack. So we returned to the ‘light’ place and I invited her to look back at the dark place. “What do you want to say to the dark place from here?” “I want to tell it to ‘f***off’ but I can hardly bring myself to say it.” I encouraged her to give it a go, and she did. It sounded powerful and releasing as she shouted at the other end of the room. She started to laugh loudly and freely. “Is there anything else you want to say or do, Sally?” “Yes!” She threw her pen at that end of the room then rushed over confidently and kicked the chair she had been sitting on. For a moment, Sally stayed in that space. “I can’t believe it, it feels so different standing here now.” She was still laughing loudly, looked almost intoxicated with her new sense of freedom, very excited and physically animated. “I feel so released!” I mirrored her posture and invited her to stay in that space for a moment, to feel that feeling, to really feel the contact with it, before closing off this session together. Sally began by telling me about a course she once attended on leadership and some of the qualities she wants to develop. I suggested we could explore these qualities as something within Sally or, alternatively, we could explore how she wants to exercise leadership within the actual system within which she already operates. She was interested in the latter option. I poured out a bag of toy figures on the table and invited her to choose which figures best represented people in her ‘system’ at work. Sally quickly picked up figures representing her director (a dragon), herself and her three direct reports. She placed them in a hierarchical arrangement which, she said, mirrored the organisation’s structure chart. She paused for a moment, “I don’t want to stay in that place (outside the circle), but where I am at the moment feels unsustainable. I need to think about what resources I can draw on to get through it.” I commented that Sally speaks of herself as an isolated leader and that she placed the figures, apart from her family, at some distance from her and from each other. I suggested that she experiment with different configurations to see how that would feel and what insights could emerge. Sally arrived late and looked stressed. She spoke in monotone, describing pressure she was feeling from her director. I reflected this back, “I’m noticing how your voice sounds flat, monotone, as it was when you spoke to the figures at the end of the last session. At the same time, you are describing things that sound emotionally stressful and painful.” Sally agreed. I asked Sally to think back to the first session. “Where on that polarity are you speaking from here and now?” “Pretty close to the dark side.” I proposed that we revisit the continuum, with Sally practising what she might say to the director at each point. I played the director. Sally sat in a chair at the dark end of the polarity and explained the director stands over her as he speaks. I stood over her and started to say some of the kind of things he says. Sally immediately sat back in her seat, leaning away from me. I asked, “What are you feeling?” She looked distressed, “Crushed, defeated.” I asked, “And what do you want to say to me (the director) from here?” She replied, “I don’t know what I’m feeling, I’ve repressed it. If I really allowed it to emerge, I would be fearful of losing my job.” I encouraged her to speak with all the passion she was feeling. She suddenly burst out with a series of swear words and immediately looked more relaxed, as if the experience had been cathartic. I invited her now to move to the mid-point on the continuum. She sat down again in a chair and as I stood over her, Sally said she would prefer I sat down too so that we would feel more equal. In order to intensify the experience, however, I persevered with ‘directing’ her without sitting down. She looked and sounded passive and defeated again. I stepped out of role and invited her to consider what she could do differently to feel more equal, rather than what she would like the director to do. “I could stand up.” I suggested she did so then we replayed the scenario, standing together. We then moved to the ‘light’ place. I invited her to sit down and to imagine me approaching her at her desk and to practise responding (a) as the bright side leader she aspires to be and (b) in an open physical, mental and emotional space, inquiring of him rather than reacting to him. I will focus this analysis on various Gestalt-orientated dimensions of this coaching experience: e.g. experimentation, engagement, use of self, contact, physicality, focus, impact. I will comment on each session in turn. The polarities idea came to mind when Sally spoke of her leadership in passive voice. On reflection, I could have invited Sally to say what her opposite to ‘driven’ would be, rather than proposing ‘driver’ myself, in order to explore further and reveal more of Sally’s own psychological construct and inner conflict (Zinker, 1977). Sally and I were taken by surprise by the strength of the dynamic that emerged as soon as we began the physical experiment. The notion of polarity seemed to resonate for her and evoked a powerful emotional response as soon as she moved along it. The physical dynamic appeared to release an emotional dynamic that was previously unexpressed (Ernst & Goodison, 1981). Sally commented how my animated walking alongside her, mirroring her movement and posture, created energy and helped her feel sufficient trust and confidence to engage fully in the experiment. I was in the experiment with her, not passively observing. My physical movement and mirroring also raised new insights into awareness for Sally, as if observing reflections of her own movement and posture in me helped her to see her own body language and expression in a fresh light. I noticed how my literal-physical ‘use of self’ in the experiment alongside Sally raised awareness and insights within me as coach that I don’t think would have emerged if I had simply directed and observed in a more reflective ‘use of self’ mode (Clarkson, 1999; Cox, Bachirova & Clutterbuck, 2010). I felt fully tuned in, ‘in the zone’, moving freely with insight and ideas emerging on route as the process naturally unfolded. The representational idea using toy figures came to mind when Sally alluded to her leadership in personal-individual terms. I wanted to broaden her awareness of his systemic relational field at work, to enable her to explore, re-contextualise and ground her experience, perspective and practice as ‘leader’ within that environment (Nevis, 1987; Parlett, 1999). Placing and configuring figures physically enabled a visual picture to emerge very quickly, a picture that represented Sally’s current perspective, psychological construct and experience of the system. As Sally and I moved to different parts of the room, we could each view Sally’s externalised system from different perspectives and share observations. When Sally physically moved the figures, she experienced her leadership and relationship to others and the system very differently. This physical shift impacted her physically, emotionally and psychologically, raising her awareness of how she was feeling and why, what her fears and aspirations were. It also enabled her to explore new possibilities and how they might feel (Beard & Wilson, 2002). The role play idea came to mind when Sally focused on her relationship with her director and how she was experiencing it. My focus was on enabling Sally to establish contact with and express her emotional experience more dynamically and authentically (Clarkson, 1999; Cox, Bachirova & Clutterbuck, 2010; Joyce & Sills, 2010). As the role play progressed, I became aware of how I was feeling as ‘director’ and how her behaviour was influencing how I was responding to her. This ‘use of self’ proved pivotal in raising Sally’s awareness. It shifted the focus from Sally’s intrapersonal experience to Sally’s and the directors’ interpersonal experience. It also provided opportunity to rehearse alternative scenarios and behaviours. Reconnecting in this final session with the polarities we had established in the first session, using the same spaces in the room as we had done before, provided a sense of continuity and movement towards completion. Revisiting the continuum and physically role-playing along it towards the ‘bright’ end provided Sally with opportunity to draw on the combined power of fresh awareness, insight, emotional experience and behaviour to achieve motivation and change (Corey, 1996). The most striking learning for me through this coaching experience was how doing with Sally made the whole coaching dynamic profoundly experiential for both of us. Moving, acting and interacting with the client throughout opened up access to new insights and ideas for me, as well as the client, in ways I hadn’t expected. This is a form of ‘use of self’, a physical mutual engagement, quite different to traditional observing and reflecting. The experimental approach had powerful physical, psychological and emotional impacts on Sally. She commented afterwards that my physically acting out with her, using the physical space together, gave her the confidence to engage fully without feeling embarrassed or inhibited. The fact that Sally and I already had a relationship of trust accelerated the pace at which she felt able to engage in the experiments. If I was working with a client where there was no prior relationship, I would have to pay closer attention to building relationship and trust first. I suggested each of the experiments we used. It provided a guiding framework for experimentation. 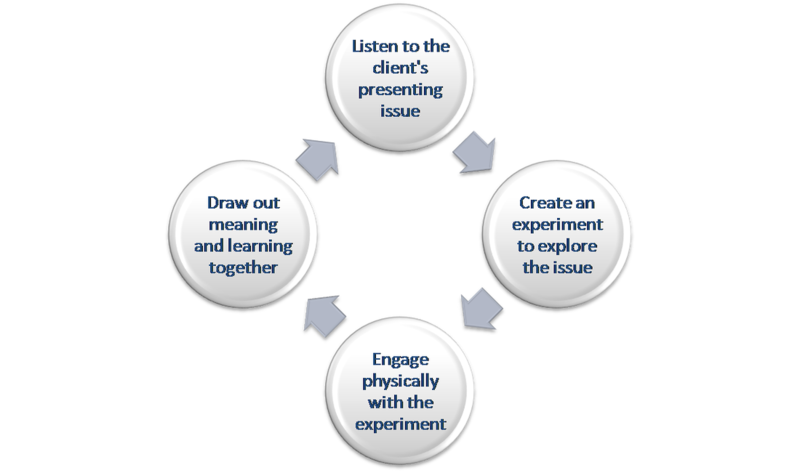 If I were to work with a client over a longer period or for a greater number of sessions, however, I would want to engage the client in co-creating experiments as a way of ensuring on-going resonance for the client and strengthening the co-active dimension. Sally found the coaching experience powerful and energising. The Gestalt approach surfaced and created fresh insight for her, allowed deeper emotional contact and catharsis and provided new behavioural experiences and alternatives. I plan to revisit this experience with Sally in 3 months to evaluate how this coaching intervention has impacted both Sally and her relational system. Nevertheless, this research and experience has confirmed my initial hypothesis, and added to it. It has demonstrated how physically doing rather than just talking – enhanced now by doing with rather than just observing – can evoke powerful dynamics within and between coach and client, a synergy that releases fresh insight and energy and transformational potential. I look forward to developing my practice further in the Gestalt-orientated coaching field. Beard, C. & Wilson, J. (2002) The Power of Experiential Learning. London, Kogan Page. Clarkson, P. (1999) Gestalt Counselling in Action (2nd Edition). London, Sage Publications. Corey, G. (1996) Theory and Practice of Counselling and Psychotherapy. 5th ed. California, Brooks/Cole Publishing Company. Cox, E, Bachkirova, T. & Clutterbuck, D. (2010) The Complete Handbook of Coaching. London, Sage. Ernst, S. & Goodison, L. (1981) In Our Own Hands. London, The Women’s Press Ltd.
Gestalt Therapy. (2011). Experimental Freedom. [online]. Available from: http://en.wikipedia.org/wiki/Gestalt_therapy#Experimental_freedom [Accessed: 23 July 2011]. Honey, P. & Mumford, A (2000). The Learning Styles Helper’s Guide. Maidenhead, Peter Honey Publications. Joyce, P. & Sills, C. (2010). Skills in Gestalt Counselling & Psychotherapy. London, Sage Publications. Nevis, E. (1987) Organisation Consulting – A Gestalt Approach. Orleans, Gestalt Press. Parlett, M. (1991) Reflections on Field Theory. The British Gestalt Journal. No1, pp68-91. Sadler-Smith, E. (2004) The Intuitive Executive: Understanding and Applying Gut Feel in Decision Making. Academy of Management Executive, Volume 18, No4, pp76-91. Sadler-Smith, E. (2008) Inside Intuition. Abingdon, Routledge. Yontef, G. (1993) Awareness Dialogue & Process. Gouldsboro, Gestalt Journal Press. Zinker, J. (1977) Creative Process in Gestalt Therapy. New York, Random House.